Several lawsuits against practitioners last year found their way around in Los Angeles and in Orange County, with varying levels of success. In addition, I believe that Cease and Desist letters were sent out by Bryan Pease and David Simon, our two allied lawyers who have helped us navigate the legal issues along the way. Also, for the first time, through the leadership of Bryan Pease, a Temporary Restraining Order was signed by a federal judge, which prevented Irvine Chabad from doing the ritual. While the TRO was dissolved minutes before Yom Kippur, it held long enough that Irvine Chabad never had an opportunity to practice Kapparot. Huge moment in the struggle! 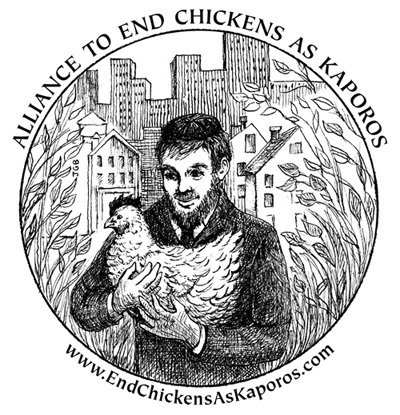 The lawsuit was between the Chabad and United Poultry Concerns, which has been directing lots of the national efforts surrounding ending Kapparot. This year, Pico-Robertson was relatively quiet. Persian congregation Ohel Moshe on Pico did not publicly perform the ritual, though they had a banner saying they were doing Kapparot, which made us very uncomfortable...it seems that either they were sending everyone to the same off-site place they sent people last year (the home of Hershel Cohen; please see next bullet point), or they really were only taking people's donations and claiming to do it in Israel for them, which defies logic because that isn't the way the ritual is done! Our sense is that they were pocketing the money as a fundraiser for their congregation. That's fine with us, as long as they get out of the chicken-Kapparot business. It is possible that Ohel Moshe once again sent people over to the house of Hershel Cohen, on Livonia Ave a few blocks away. At the beginning of the week of Kapparot, the day after Rosh HaShanah, activists found there were boxes and other signs of chickens being held at Mr. Cohen's home. Early on, LA Animal Services showed up there, presumably as a result of an anonymous phone call from an animal rights activist who were worried there were signs of the practice taking place. We also learned this year that many of Mr. Cohen's neighbors are uncomfortable with the activity at his home, noting that it always smells over there. This has led us to ask: is he doing this year-round? For the second year in a row, the Noroullah family did not seem to perform the ritual in any public venue. Thus, there was very little, if any, Kapparot in the Pico-Robertson area, which was where this campaign began. However, activists this year posted signs in the Pico-Robertson area that there was going to be a "Compassionate Kapparot" ceremony at Nessah Israel, and Rabbi Yonah Bookstein hosted his own "Chickenless Kapparot": https://www.facebook.com/events/637868043040714/. Needless to say, this created conflict. When we showed up on Sunday afternoon for the first day of Kapparot for HDC, we were greeted by over fifteen police officers and two private security guards, and the site was roped off from the community. Rabbi Louie and his supporters were defiant in every way, including shoving protestors and even allegedly spitting on one activist. One activist, Desiree Mehrez, was arrested for trespassing when she entered into the tented area. VIDEO OF THE INCIDENT SHOWS A JUBILANT RABBI LOUIE SINGING "AM YISRAEL CHAI" AS SHE IS BEING HAULED AWAY BY LAPD, QUITE DISTURBING : After two days of overwhelming LAPD presence, after LAPD left, some frustrated activists apparently damaged HDC's tented off area in the alleyway. While she tells us that she was not involved in damaging property, one leader, Lola Kay, was picking up materials in the back alley after the damage had been committed and Rabbi Louie found her there and called upon LAPD to arrest her. After over 24 hours in Van Nuys jail, her bail was reduced from $20,000 to $10,000, and activists pooled resources to purchase a bail bond to get her out. Last year, activists were horrified regarding the Kapparot activities on the last day of Kapparot at Yeshiva Ohr Elchanon in Hancock Park. This year, we planned a number of public actions...however, the community there chose to go underground. Activists found notices in a nearby apartment complex explainign that they were not doing the open court Kapparot that they had in the past, but that community members should go pick up their chickens for the ritual at a particular site near Hancock Park. Thus, there was no public action. There were a couple of sites in Orange County. While I was not as engaged in those organizing against Kapparot there, I can only indirectly note that there was at least one Chabad that was doing it; apparently, activists rescued the only chickens saved this year there. New York was, predictably, as bad as it gets, again. their situation is very different....one key problem is the lack of Orthodox rabbis willing to protest this ritual. The birds in New York tend to be broilers and not spent egg-laying hens, as I understand it. The Temporary Restraining Order was rescinded minutes before Yom Kippur, which was long enough to prevent Chabad of Irvine from performing the ritual this year (however, there is a sense that they were not planning to perform it again this year; last year they didn't do it). We are seeking a clear statement from Los Angeles Sanitation Department as to what happens to the dead chickens once they pick them up through dead animal pickup. We appeared at the Los Angeles Animal Services hearing on October 11th and provided testimony. Our primary concern was the lack of coordination between different departments of the City. That covers it for now. As you read this, please let me know if I am missing any critically important details. Thank you to all those who care about these birds and care about the future of the Jewish people, both of which are worthy of continuing this struggle. A future email will hopefully detail next steps.